When Fr. Dunstan Schmidlin started the Southwest Indian Foundation back in 1968, he felt a sense of urgency. With a true Franciscan's love for the land and the harmony for creation, he was deeply troubled by the plight of his Native American brothers and sisters. Where once these noble Americans had lived close to the earth, they now seemed displaced in their own land and disillusioned with their own dreams. In the relentless march of progress, they had somehow been left behind. They were the forgotten Americans. We have always striven to maintain the original intentions of our Franciscan founder. First, to recognize the great human potential of each individual and second, to offer those in need a hand - not a handout. To our way of thinking, a mere handout destroys a person's dignity and self-initiative. We believe that true charity must emphasize self-help in order to restore pride and independence. Southwest Indian Foundation is a non-profit, charitable organization that relies solely on private donations. We receive no federal dollars. Our primary sources of funding are not huge corporate gifts or impersonal grants. Instead, they are individuals like you. Americans helping Americans. Southwest Indian Foundation assistance is strictly limited to Native Americans - with priority given to the elderly, handicapped, and families with dependent children. Along with the Navajo, we also serve the Zuni, Hopi, and other indigenous people of the area. Our services include: Substantial school grants and individual tuition assistance, homes for battered women and children, home repair and wood stove installation, Christmas food baskets for needy families, alcohol counseling, and emergency assistance in the areas of food, clothing, heating fuel, and temporary shelter. In addition, a few years ago we launched out Indian Craft Catalog to provide a national outlet for Native Americans to sell their precious handmade goods. You are currently viewing the on-line version of this catalog. The profits from this catalog go directly back to the Native Americans themselves in the form of our many philanthropic programs. So please take a few minutes and look over our extensive catalog. And remember, when you order something from our catalog you are not just buying wonderful and unique gifts - you are actually changing lives! 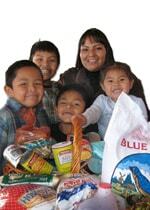 Our primary goal at the Southwest Indian Foundation is to lessen the poverty and unemployment among the Native Americans of the Southwest, specifically members of the Navajo, Zuni, Hopi, Laguna, Acoma, and Apache. Through self-help initiatives and charitable donations, we are attempting to restore dignity and self-reliance to these native peoples. In addition, we strive to treat you -- our donors and catalog customers -- with the utmost respect, never taking for granted your kind and generous financial assistance towards our many critical programs. Though we are located in a remote region and our catalog primarily features handmade goods created by individuals working out of their homes, we attempt to provide the most timely and accurate service possible. But on those occasions when we fail to live up to this standard, we do everything in our power to remedy the situation. 56% of Navajos on the Reservation live below the Poverty Level. 43% of labor force on the Reservation is unemployed.